Mineral Point is well-located as your base for exploring the Driftless Region of Southwest Wisconsin. It’s called “driftless” because it’s free from glacial “drift” – the rocks and residue left behind by retreating glaciers. The hilly, unglaciated Driftless Region is a place of gentle beauty, left untouched by ancient glaciers. 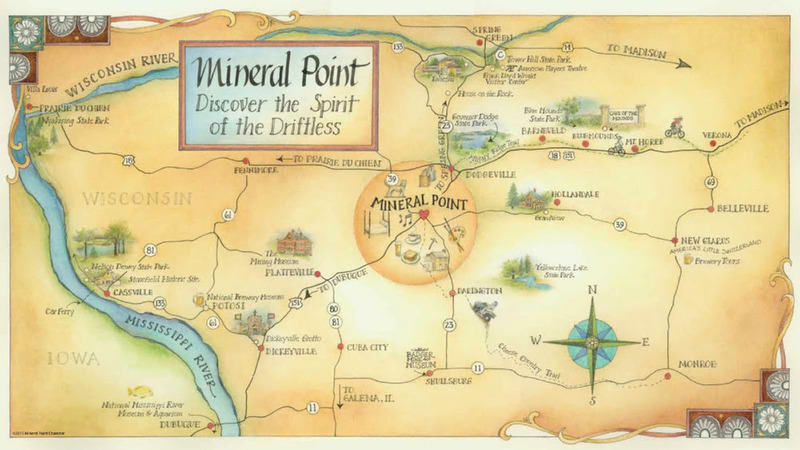 While there may be no drift here, there are plenty of attractions, as demonstrated by this treasure map, issued by the Mineral Point Tourism Commission and hand drawn by artist Julie Sutter-Blair. Recently, Chelsey Lewis, an editor for Wisconsin Trails joined craft beer reporter Kathy Flanigan on a beer tour of the Driftless Region. Click here to read their article in the Milwaukee Journal Sentinel. The two reporters spent the night at Mineral Point’s Brewery Creek, a unique B&B&Beer that was named one of America’s top ten luxury beer vacations. While in town they also visited Tom and Diana Johnston’s Brewery Pottery, the expansive gallery housed in a former brewery. They toured Pendarvis. They met with Roland Sardeson and visited his unique lodging space – Tuckpoint. And before leaving town, they interviewed local artist Bruce Howdle who explained how Mineral Point architecture is some of the oldest you’ll find in the tri-state area. Here’s a link to the interview with Bruce. Book a room in Mineral Point, pick up one of these treasure maps, and spend a few days exploring the captivating Driftless Region. This entry was posted in Lodging and tagged Beer Tour, Brewery Creek, Bruce Howdle, Driftless Area, Mineral Point WIsconsin, Pendarvis, Roland Sardeson, Treasure Map, Tuckpoint. Bookmark the permalink.